Do we (mis)recognise the political power of Twitter? We are told that Twitter is the new public sphere, the place where we hold government accountable, encourage diverse voices, and provide resources for public benefit like education, healthcare, and welfare. Using the #metoo campaign as a case study, Naomi Barnes and Huw Davies question whether Twitter really is a public sphere or if it is simply a platform capitalist that monetises displays of outrage? Twitter is, of course, many things to many people. It is a place people have connected, had ideas developed, and views broadened. However, it is also violent – a place of trolls, masked and unmasked hostility, overt fascism, and even nuclear brinkmanship. Whatever the experience, Twitter is made possible by platform capitalism – a business plan that incentivises outrage to monetise it. But we are told we shouldn’t give up on it just yet because it is also a place where social justice issues such as police shootings, domestic violence, and sexual harassment have been recognised and given a public platform; but so have their deniers. Therefore, whether Twitter holds the potential for social justice is an open and complex question: to explore it we apply two different conceptualisations of misrecognition to the #metoo campaign. The #metoo campaign offers just one of many possible case studies that could help develop this critique. A decade ago Tarana Burke, an activist from New York, initiated the original #metoo campaign to aid underprivileged women of colour affected by sexual abuse. It was reignited in response to allegations of sexual assault against Harvey Weinstein, Kevin Spacey, and other influential male Hollywood personalities. The hashtag movement encourages women to speak out about incidents of sexual harassment. It works as a clickable symbol of solidarity and has established momentum in recognising the immensity of the problem of sexual harassment and assault in the workplace. But is Twitter an effective public sphere to bring harassment and assault out into the open where it can be politicised? What is the public sphere? Habermas (1989, cited in Fuchs 2013) argues that the concept of the public is related to the notion of the common that is associated with ideas like community, the common use of resources like a marketplace or a well, and communal organisation. Fuchs has already made a significant contribution to the debate as to whether Twitter can be conceptualised as a public sphere but does not explicitly address these structural intersecting gendered, racial, and ethnic biases within Twitter and other social media platforms. He argues that Twitter’s reality contradicts Habermas’ utopic promise of an ordered and respectful bourgeois society, but that does not mean it is not a public sphere. Tweeters participate in a broader “affective public” with its own emerging rules, norms, and codes of behaviour, as well as structural racisms and subjectivity. Moreover, we don’t all arrive at this sphere as equals class and cost shape digital participation. It is these institutionalised biases that we pick up and expand for analysis. Feminist philosopher Nancy Fraser critiques the white middle-class boundaries of Habermas’ definition. She describes second wave feminist activists’ aim to make private matters public in order to politicise them by pressuring policymakers into distributing public resources to underserved people. Such campaigns included demands for maternity leave, childcare, equal opportunity in the workplace, shelters for women subjected to domestic violence, and legal recourse. Employment stability when sexually harassed in the workplace is part of this campaign. Fraser argues our society’s failure to effectively address these issues is an act of misrecognition or being denied access to political parity because of the (sexist, racist, classist, ableist, xenophobic) cultural values of institutions, like Twitter. She sees misrecognition by institutions as a serious violation of justice. The #metoo campaign can therefore be seen as an attempt to address this misrecognition by calling out injustice on social media. In Fraser’s definition of the public sphere and reminiscent of Mills’ famous quote, the hashtag has worked to make a private trouble public. However, Fraser might argue that while the problem is recognised as being widespread, without genuine structural and political change and efforts to distribute resources and represent the needs of the misrecognised beyond social media, this recognition alone is insufficient action for parity. Image credit: Hashtag by ecodallaluna. This work is licensed under a CC BY-SA 2.0 license. Bourdieu offers a different definition of misrecognition. He calls it a failure to recognise how normatively defined social environments may be working against our interests. Twitter is a form of capitalism that seeks to harvest data at a scale and complexity that is useful to advertisers: the more tweeters who are tweeting the more valuable Twitter becomes. Platforms are hungry for words and have written algorithms that encourage us to continuously feed them by looping news and media that personally resonates. More broadly, platform capitalism’s business model has mobilised the gig economy, which valorises casual and temporary contract work. One of the advantages of the gig economy to business owners is that it limits dissent. Therefore, if victims of sexual harassment and assault working in casual and temporary contracts speak out, there is a very real chance they could lose their job. Women who are living in precarity and poverty lack representation and resources to bring the issue into the public sphere in a way that will change the inequitable social structures that allowed sexual harassment to go unchecked for so long. There are further complexities of culture and access which we do not have room for in this post but need concerted attention. Like similar campaign such as #everydaysexism the #metoo hashtag has offered hope and validation to millions of women. Digital mediation also “enables new connections previously unavailable to girls and women, allowing them to redraw the boundaries between themselves and others”. However, what James refers to as trying to act ethically in an unethical space can compound a problem. 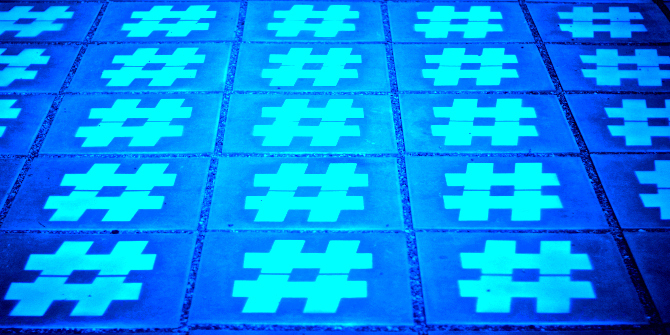 We must remember it is in the best interests of the platforms to keep people feeding the hashtag, but not moving the issue into the public sphere where policy solutions can be implemented that will affect the platform capitalists’ working conditions. However, if the campaign is not translated into meaningful change there is a danger that we have misrecognised Twitter’s social emancipatory potential by ignoring the distinctly unjust environment of the platforms. The democratic illusion that social media has performed needs further transnational and intersectional interrogation. The nature of social action has changed to both include and be impeded by platforms. Every blog, tweet, or post that attracts a lot of attention and discussion needs questioning as to whether it is misrecognising change. Without concrete public action, words online remain in the privately owned domain of the platforms whose assets are our words. Maybe change begins with a hashtag, but it has to be followed by an expanded intersectional critique of social media and the public sphere. In our plans of action we to need to address what it means to be a politically active digital citizen and how political, cultural, and economic parity can be achieved in a world mediated by platforms. Naomi Barnes (@DrNomyn) is a Senior Research Assistant at Queensland University of Technology, Australia. Naomi has previously written on Facebook mediated student voice and academic blogging. Her website is Critical Theory of Technology. Huw Davies (@huwcdavies) is a researcher at the Oxford Internet Institute, University of Oxford (@oiioxford) and co-convenor of the British Sociological Association’s Digital Sociolgy Study Group (@BSADigitalSoc). This is a very interesting and very timely blogpost. Thank you both. The notions (and practices) between what is public and what it private could not be more convoluted nowadays because of the online world. I guess, this is , in part, because the ‘screen’ can work both as a shield and a projector. It can provide some sense of safety net, but it can also raise the voices that often go unheard in other spaces, or that at least do not get the exponential (at)traction as that afforded by social media, being Twitter a very powerful tool in that regard. It’s very important to explore such platforms (and the practices therein developed) from such perspectives. So your take is very welcome. I am particular interested in the Habermasian perspective given Habermas’ proposal of ‘communicative action’. The way I see it, communicative action is becoming (more so now) a key literacy to being able to engage online in a democratic fashion, especially when it involves political and activist debates. I have often read critiques of Habermas’ work on the public sphere where his work is deemed utopic. However, I find that to be a curious reading of his work. Having read Utopia my Thomas Moore myself I think that Habermas’ work rather than being utopic (in the literal sense of the word) portrays in essence an ideal of communication to which we should aspire. It has an educational purpose attached to it, in my opinion. Habermas proposes the idea that we should engage in debate while weighing in on all the sides of the ‘story’/topic/issue under discussion so that we can arrive at a consensus/reach an agreement. Thomas Moore’s Utopia, on the other hand, proposes a form of equality (and community) only achievable through the uniformity of ideas, practices and status. Curiously enough, what many social media platforms are enabling is exactly the congregation of people who present a high degree of uniformity not only regarding their ideas, but also their social, economic and cultural contexts and status. Although different groups co-exist online they rarely traverse the boundaries that they have unconsciously imposed on each other through the ideas they share. In this vein, the web presents little scope for deliberation, not because of its architecture, but because of the structures their users orchestrate. In that regard, more often than not, social media enables an echo chamber culture where beliefs are held and reinforced but very rarely challenged with the purpose of moving the debate forward. This is further emphasised by an elementary level of recognition – interpersonal recognition (Hegel, Honneth) – where the speaker and the interlocutor recognise in one another the ideas/experiences/practices of the other as a form of identity. So I think that true change will only happen when we start engaging in true democratic debates. Habermas conceptions of communicative action and rationality offer us some interesting key tools with which to work. The problem is that social media is laden with emotion (and interests of all sort) rather than rationality. Thanks for the post and the reflection it provoked in me. I think a number of researchers have found that hashtag only work alongside I the ground organising. But on #metoo it led to conversations with men, my 3 teen daughters (who are frequently sexually harassed), and my daughters’ school. So that might not be measurable action on terms of changed response from government but it certainly increases awareness (men often aren’t aware) and actions that may not be on the political radar. I would think the only way to know is to survey women who used it and find out what practical action they took after the hashtag.